I'm really an organized person who is trapped inside the body of a procrastinator. Or maybe I'm on a procrastinator trapped inside the body of an organized person? 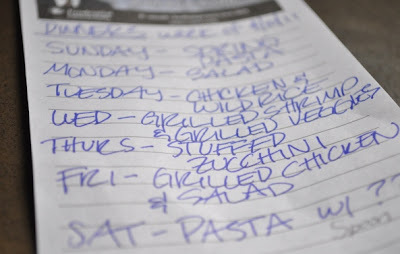 Planning ahead isn't my strong suit, especially when it comes to meals. Even though there is reward in pre-planning, relieving a great amount of stress, I can't seem to bring myself to do it on a consistent basis. On the occasions when I am organized, I write out a list of what meals we will have each night (usually on one of those free notepads that realtors leave on your front door step) and stick it on the fridge. Some of the meals are more like general ideas that I keep ingredients on hand for. Like salad fixings, meat and shrimp for grilling, or pasta. Other meals, like Spring Pasta are made fresh that evening or Chicken and Wild Rice Casserole and the meat sauce for the stuffed zucchini are made ahead and then frozen for future use. Stuffed zucchini is easy to make and it's satisfying and delicious. You get your meat and vegetables all wrapped up into one nice little package. The zucchini pairs nicely with a hearty meat sauce. I serve 2 zucchini boats as a main dish and it can be rounded out with a nice dinner salad or a crusty piece of fresh bread. If you're leery of zucchini, it's a very mild vegetable and very versatile. It's taken me years to ease my Hubby into eating more and more vegetables and zucchini has turned out to be one of his favorites. We eat it at least once a week and sometimes more, when it is in season. The key to making this dish easy is making your meat sauce/filling ahead. I like to make a large batch on a weekend and portion it out into ziploc bags or storage containers and freeze it. The recipe below makes 12 cups which I divided up into 4 three cup portions. It's about time for another batch because I just used my last one up for this zucchini. Give this tasty dish a try! Preheat oven to 450. Spray 9x13 baking dish with cooking spray and set aside. Slice ends off zucchini. Cut zucchini down the middle lengthwise. Use a small spoon to remove zucchini seeds and pulp and hollow out zucchini leaving a well to place the filling in, leaving at least 1/4 inch of zucchini on each side. Set aside zucchini pulp and finely chop. Squeeze out liquid from the pulp and combine in a medium bowl with meat sauce. In a small bowl combine panko and parmesan cheese. Season with salt and pepper. Arrange zucchini boats in the baking dish. You may need to trim down zucchini to fit in the dish. 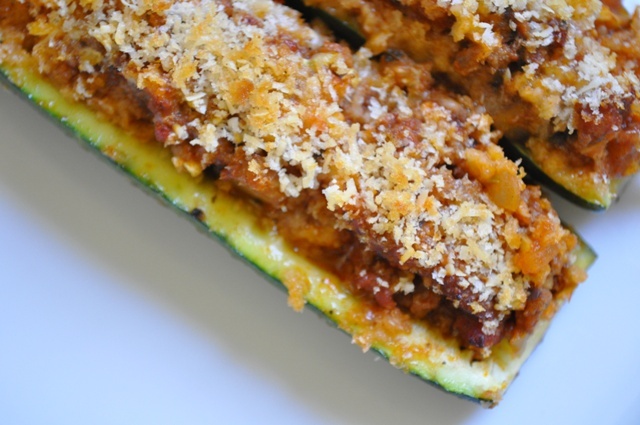 Lightly salt each zucchini boat and then fill each with a generous portion of meat sauce. I like to pile it high. Sprinkle each boat generously with the breadcrumb mixture and lightly drizzle olive over the top. 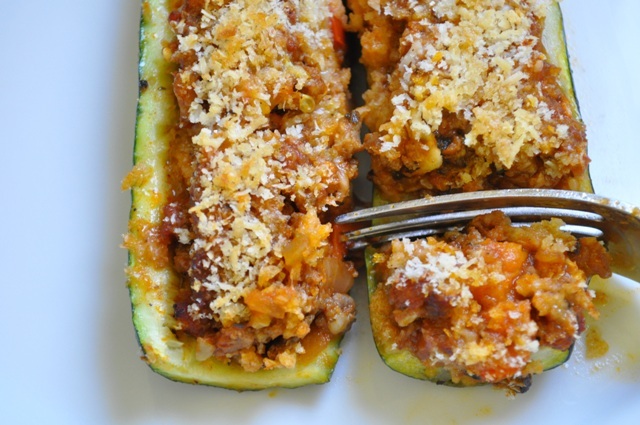 Bake for 25 minutes or until zucchini is tender and breadcrumb mixture is lightly browned. Top with fresh basil and serve two boats per person. Heat olive oil in a large pot (such as an 8 quart pot) or dutch oven on medium high heat. Saute red pepper and onion for 5 minutes. Add mushrooms and continue cooking for 7 - 10 minutes until mushrooms release their water and vegetables are lightly browned. Season lightly with salt and pepper to taste. Add garlic and cook for 2 more minutes. Meanwhile, heat a large non stick skillet to medium high heat and add ground beef and sausage. Generously season meat with salt and pepper and brown meat until just cooked through. Drain fat from meat and add meat to the large pot with the vegetables. Add marinara sauce and dried basil and stir to mix thoroughly. Turn heat up until sauce just comes to a boil, then reduce heat and simmer sauce for 30 minutes, uncovered. If you plan to freeze sauce, cool it and place desired amount in freezer ziploc bags, removing any air. To thaw, take sauce out of the freezer the night before you plan to use it and place in the refrigerator. I love this idea Gloria! There's always so much zucchini from my step-father's garden and I can never figure out what to do with all of it. My husband has been trying to get me more into veggies over the years too. I may have to give this one a try, as I like that you described zucchini as a mild veggie. And the filling looks and sounds super delish!